by Tania L. Balan-Gaubert M.A. Tatyana Fazlalizadeh is getting a lot of attention from the streets. 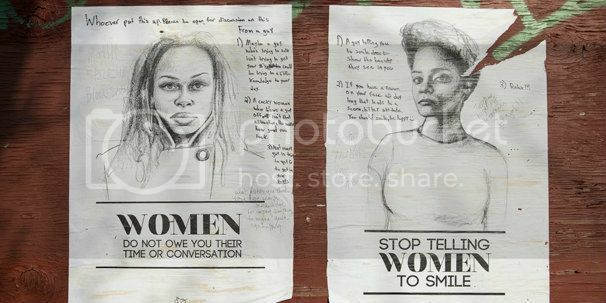 A Brooklyn-based oil painter and illustrator from Oklahoma City, her art project, "Stop Telling Women to Smile," has raised eyebrows on the frequently discussed but seldom addressed topic of gender-based street harassment. Fazlalizadeh draws from her experience and the experiences of other women with street harassment to create portraits of real women. The wheat paste posters juxtapose a woman’s portrait with phrases like “Stop Telling Women to Smile,” “My Name is Not Baby” and “Critiques on My Body Are Not Welcome.” The project aims to give women a voice in resistance to objectification, while commanding men to think. Fazlalizadeh recognizes that not everyone who views her posters will understand their message. Street harassment is so embedded within the daily interactions between men and women, that it almost seems natural. Yet, there is nothing natural or acceptable about the feelings of discomfort, fear or embarrassment felt when a man calls out “smile for me” or “hey baby” on the way to the grocery store, to work, to school or home. The medium of public art and portraiture however, is not silent. It is provocative and personal. Fazlalizadeh’s work forces an internal conversation that confronts sexual harassment’s normalization. The social conditioning of both men and women to view women’s bodies as objects of pleasure creates an environment where women must consistently reconcile who they are versus what their parts represent in society. “Stop Telling Women to Smile” challenges these conventions by unapologetically confronting misogyny and objectification. For some men, the discourse centers around their perception that women want male validation, that they have a right as admirers to make their feelings known publicly, and that their advances are their way of complimenting women, not degrading them. For some women, the conversation affirms the anger, frustration and insecurity that comes with daily sexual surveillance and empowers them to know they are not alone. By problematizing the comfort that some men have in verbally, physically and mentally intruding upon a woman's space in the street, Fazlalizadeh’s project makes a powerful statement. With the streets’ attention on her work, Fazlalizadeh emphatically talks back to all harassers with an artistic middle finger. No doubt, some will get the picture.